So what is Diggers’ Drive? – Save Diggers’ Drive! ABOVE: The Brisbane City Council erected this sign at the western end of the post-Great War roadway created by returned First Australian Imperial Force personnel in the 1920s to earn a wage to feed their families. Photo courtesy of Peter Collins. So what is ‘Diggers’ Drive’? THESE are the words that appear on the Diggers’ Drive sign (shown above), located near the entrance to Kalinga Park, at the end of Park Avenue, Eagle Junction. At the urging of The Shire of Toombul History Group, Brisbane City Council erected this sign to inform visitors about the heartwarming story behind the creation of this unique World War I memorial. “THE Rt. Hon. Lieutenant-Colonel Sir Matthew Nathan, GCMG, Queensland Governor from 1920 to 1925, officially opened Diggers’ Drive in Kalinga Park on the afternoon of Saturday, May 31, 1924. “The 1st Clayfield Scouts, 1st and 2nd Albion Scouts, 1st Nundah Scouts and Cubs, and the Kalinga Cubs, formed the Guard of Honour for the Governor’s arrival, and the Brisbane Citizens’ Band played under their conductor, Mr A. Kaiser. “After the Governor’s arrival at 3pm, the Brisbane Citizens’ Band and the Guard of Honour marched at the head of his car to the centre of the park, where the opening ceremony was performed. The event was presided over by Cr Frederick W. Bradbury [ Frederick William Bradbury – a carpenter, of Toombul Terrace, Nundah], chairman of the Toombul Shire Council. “Diggers’ Drive was a major outcome of the formation and subsequent efforts of the Kalinga Unemployed and Distressed Soldiers’ Committee, chaired by Cr J.P. Peterson [ James Peter Peterson – a grazier, who resided at Mardan, Adelaide Street, Clayfield], the Kalinga Division representative on council. “After World War I, the Commonwealth Department of Repatriation placed unemployed returned soldiers in jobs. “But it was a lengthy process, and, in 1922, there was a period of major unemployment and economic distress among returned soldiers and their dependents. “Strong efforts were made to deal with the situation by forming a citizens’ committee in Brisbane, which established a clothing depot and raised a considerable sum of money, which did a great deal to help. “It was considered, however, that additional assistance could be given with the formation of local committees, which would concentrate on raising funds to provide relief work for soldiers, no matter where they lived. “That same year, a meeting of the residents of Clayfield was called. “The outcome was the previously mentioned Kalinga Unemployed and Distressed Soldiers’ Committee, which was formed to lessen the extent of unemployment and distress among the men and their families by providing additional assistance to find work for the returned soldiers. “It was that committee that arranged with the Kalinga Improvement Committee of the Toombul Shire Council that, any soldiers, sent by its members to the Improvement Committee, were to be given work in road formation and drainage in Kalinga Park. “In all, 83 returned soldiers were given employment. They were from Kalinga Division of the shire as well as from other metropolitan and suburban areas across Brisbane. “Their effort resulted in the formation and gravelling of 60 chains [about 1,200 metres] of roadway in Kalinga Park, the planting of 120 trees in Hendra and Kalinga Parks, and other filling, and drainage and improvement work to improve the Park. “It was the committee’s intention, with the consent of the next of kin, to identify and name the deceased soldiers who had originally enlisted from the Kalinga Division. “This was to be done with inscribed metal plates, that were to be placed on as many of the trees as necessary. But it was recorded that it had been difficult to obtain the names, and it was not possible to have the plates ready for the opening ceremony. “One of the reports about the opening ceremony stated that the Drive was ‘a splendid piece of roadway for wheeled traffic, extending over three-quarters of a mile [some 1,200 metres] through Kalinga Park, situated midway between Toombul and Eagle Junction’. “As part of his address, the Governor made several observations about the building of Diggers’ Drive. He mentioned particularly that the local community welcomed the special opportunity to commemorate the brave dead soldiers of the Division with the labour of their returned mates. “The Governor also stated: ‘In thus creating a reputation for a desire to do hard work amongst the unemployed in general, and the unemployed Diggers in particular, the 83 men, who have worked with the committee under the direction of the Toombul Shire Council, have helped others to get work in the future. “We hope that the scheme for identifying the trees with the names of deceased soldiers who enlisted in the Division may be successfully carried out, and in this hope I declare the Diggers’ Drive to be open’. “At the opening ceremony, one of the returned Diggers from Kalinga Division, Major-General Reginald Spencer Browne, [ a journalist on The Brisbane Courier, who then resided on Melton Road, Toombul ] represented the Brisbane district of the Returned Sailors’ and Soldiers’ Imperial League of Australia. Captain Richard O’Bryen [ Richard De Burgh Falkener O’Bryen of The Central Hotel, Hughenden ] also represented the Diggers. “Other representatives at the official opening of the Drive included the Member for Nundah, William Kelso MLA, [ an accountant, of Boyd Road, Nundah ] the Member for Toowong, J.F. Maxwell MLA, [ James Francis Maxwell – a master painter, of Kilrooney, Riverview Terrace, Auchenflower ] and the Member for Toombul, A.L. Petrie, MLA [ Andrew Lang Petrie – a monumental mason, of Chatsworth, George Street, Brisbane ]. ABOVE: In 1924 a motor vehicle traverses the newly-completed Soldiers’ Memorial Drive – later to be formally designated ‘Diggers’ Drive’. Note the saplings enclosed in staked tree guards in the middle foreground and along the roadway on the left of the photo. Because the name ‘Diggers’ Drive’ had never been formalised, it was lost to the community over a couple of generations. That was until historian, Elizabeth Nunn, rediscovered the name along with information about the project to build the roadway, as well as the subsequent opening ceremony. During the late 20th Century and early 21st Century, the Brisbane City Council has undertaken substantial work to enhance the roadway and the lovely trees along its length. ABOVE: This early map indicates the existence of the memorial drive built by the Diggers in the early 1920s. 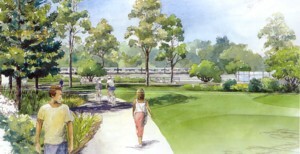 Note the additional pathways that connect to Diggers’ Drive and the obvious continuation of the roadway east of the railway overpass, linking to Sandgate Road itself.